Tired of the same old alphabet flash cards? Need to get your kids moving? We know that kids learn better when there is a kinesthetic component to learning. 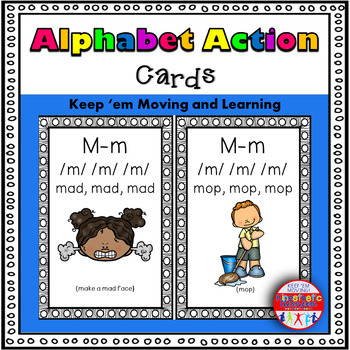 Here is a 91 card set of alphabet action cards. I use these at whole group time, but once the kids get familiar, they can also be used as an independent literacy center. I hold the card up and kids say the letter three times, the sound three times, and then do the action three times. There are several cards for each letter so you can trade them out to make new sets. There are also cards for both the short and long sounds of the vowels. I teach my kids right away that the vowels make 2 sounds, so I would put my set together with two of each vowel to start.